Deputy Commissioner of Police Mervyn Richardson. PORT OF SPAIN — The man leading the probe into “emailgate” said yesterday there was no prejudice in the investigation and he will not let politics tarnish his work. 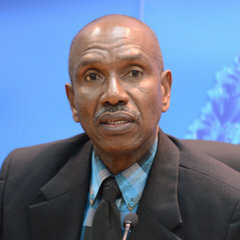 Deputy Commissioner of Police Mervyn Richardson, in a brief telephone interview with the Express, said the police did not leak any information to the media, following an interview with Opposition Leader Dr. Keith Rowley on Tuesday. On Wednesday, the Express received a report that Rowley had refused to hand over his computer, but Rowley, in an immediate response, described the reports as “completely untrue and totally false”.